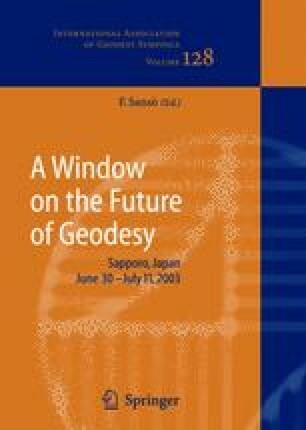 The determination of the geoid represents a central task in geodesy. In this matter airborne gravimetry provides a fast and reliable method for geoid determination especially for those regions, which are difficult to survey. In addition with respect to the spectral representation of the earth’s gravity field in terms of spherical harmonics airborne gravimetry is capable to fill the gap with regard to the medium wavelength contribution. With current airborne gravity systems an accuracy of 2–3 mgal (rms), with a resolution of 6–15 km can be achieved. Data processing becomes more significant to meet the demands for a geoid with centimetre-accuracy. Besides the task of pre-processing which results in band-limited gravity disturbances at flight level, the choice of a proper downward continuation method gains in importance. Besides the problem of regularization most calculations are based on block mean values, which has disadvantages in the approximation accuracy. This paper will compare two different approaches of downward continuation of simulated airborne gravimetry data. In the first approach gravity disturbances derived at flight altitude are directly transformed to the disturbing potential at geoid level. This method derives the disturbing potential in terms of block mean values, which are not continuously differentiable. With respect to that problem an alternative approach is proposed. This method will make use of space localizing spline functions to represent the disturbing potential at geoid level. It will be shown that this will increase the accuracy regarding the resulting geoid noise.